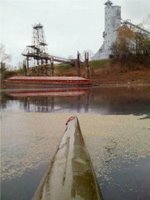 The Memphis harbor is a tremendous asset for our city, but paddlers have reported new harbor pollution -- "black water, grain-like substance, smelly." The Flyer reported it. The question: What is it? What’s the cause? Here’s the article. River and harbor users would like to know. The strange, smelly substance that darkened the Wolf River Harbor recently was apparently not an oil slick. The unpleasant change in the harbor north of downtown was noticed by kayaker Elmore Holmes and others who use the waterway and the Mississippi River for recreation. "Whatever happened happened a while before I noticed it," Holmes said. "Basically, the water is just black at the north end of the harbor." He said it looked like an oil slick but smelled more like raw sewage. Last weekend, Holmes noticed a "bathtub ring" along the shoreline after the water level dropped. It appeared to contain a grain-like material. "I then remembered a boater friend telling me a month or so ago that he saw workers at the Bunge plant dumping large quantities of a grain-like substance in the harbor," Holmes wrote in an e-mail to city officials and river users. "I'm not sure how such a thing would turn the water black, but too much of anything can be harmful to a body of water," said Holmes, a woodworker who frequently uses the river for kayaking and canoeing. Bunge Corp., located on North Second Street, is one of the commercial users of the harbor that is shared by barges and pleasure boats launched from Mud Island. The residential area of Mud Island backs up to the harbor, which has been littered with trash from storm sewer runoff. At low water, trash, odors, and pollutants are especially apparent. Terry Templeton, manager of the Tennessee Department of Environment and Conservation, told Holmes that the substance probably was not oil, but the state and city are still investigating. James H. Baker, project director for the Tennessee Water Sentinels and a kayaker and member of the Sierra Club, said the black water may indeed be related to grain elevators and the loading of grain onto barges. "If the grain-like material (most likely soybean dust, as that is what is being harvested now) gets into water, it will decompose," Baker wrote. "The products of that decomposition will have a smell similar to raw sewage, and in enough quantity, the decomposition products will discolor water." "I sincerely hope that grain elevator operators are not deliberately pushing the excess grain that settles on the decks of the barges overboard into Wolf River Harbor. As the author of the first City of Memphis storm water ordinance, I'd say that would be a clear violation. Deliberately pushing excess grain into the harbor would also violate any of these grain elevators' storm water permits that are issued by the Tennessee Department of Environment and Conservation." "On the other hand, there are a number of sanitary sewers in the area that may need to be checked to see if they are not leaking into Wolf River Harbor." "Perhaps the environmental regulators should take some water and sediment samples in the vicinity of the grain elevators' loading platforms and test them. ... They should also consider testing the water column for dissolved oxygen and, just to make sure that raw sewage isn't involved, sample and test for E. coli as well." "Like you, I'm endlessly fascinated by the Mississippi River's geography, geology and culture and the recreational and economic opportunities it affords to Memphis. A dirty riverfront will negatively impact Memphis' economy and its citizens."